No images are shown i Firefox 3 with ckfinder (v.1.2.3). Some help with this? Firefox 2 (Mac) everything is OK.
Firefox 3 (Win). Same page, but no images. I have no solution, but I discovered if you disable then enable CSS (for example with StyleSheet Chooser Plus 1.2.0 plug-in for Firefox 3), the images are shown !!! You should try again with Firefox in Safemode (no extensions). The problem can be some extension that isn't really compatible with Firefox 3 or it's messing with the page in any way. I tried starting Firefox in Safe Mode, but the problem persists ! Does the demo work for you? 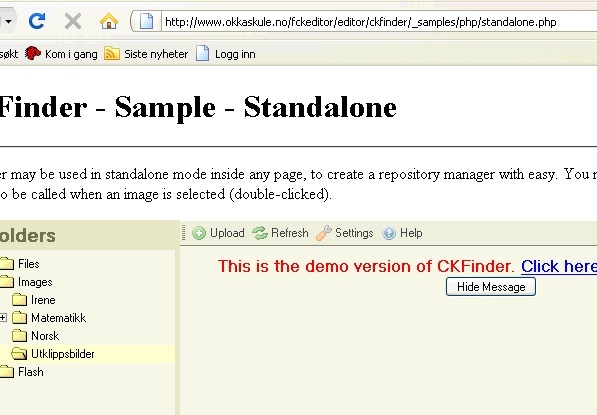 Yes, the CKFinder Demo works with Firefox 3 ! I'll compare my code and the demo code (css, js, ...) and post a solution tomorrow... I hope !!! I downloaded the last version of CKFinder. - the variable $baseDir is set to the complete path (depends on your web server) (for example : $baseDir = '/home/www/.../.../...../userfiles/'); //don't trust the resolveUrl function, comment it ! I hope it will work for you ! I cant get this right. 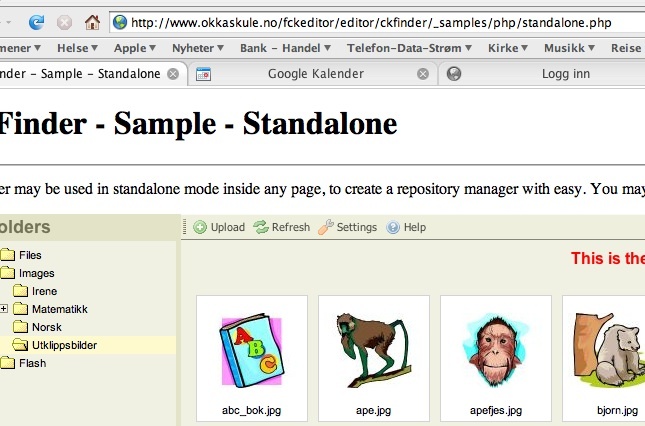 This is my path to an image: "http://www.okkaskule.no/brukerfiler/husabo/images/image.jpg"
So what is my correct $baseUrl and $baseDir? I'm not shure I understand the difference of baseUrl and baseDir.